The Goldsmiths’ Company Assay Office is where hallmarking began, and we have been testing and hallmarking precious metals for over 700 years. Our reputation for excellence in hallmarking, service, and support is both revered and unparalleled. Our integrity is part of our heritage and is renowned. Truth and transparency in what we do is vital, reflecting our historic company motto “Justice is the Queen of Virtues”. integrity likes at the heart of everything we do. The skill of our teams honed over our remarkable history, our continuous investment in training, apprenticeship schemes and state of the art technology and equipment has made the London hallmark revered for its quality. Our service is unrivaled and being part of the Goldsmiths' Company means we are committed to supporting the jewellery and silversmithing trade. Read about our Support for the Trade here. Now, we regularly hallmark 3 million articles each year. In addition to our Goldsmiths’ Hall headquarters, we operate at a range of different sites, each situated to make life as convenient as possible for our customers. These include premises at Greville Street, in the centre of the Hatton Garden jewellery quarter and at Heathrow Airport, which provides a premium fully insured door-to door service for imported goods. Discounts To sell your items, by law, you need to have your precious metal articles hallmarked (weight exemptions apply). The GCAO are proud to offer members of the GoJD either a 20% discount on a punch & laser registration (dual methods), OR a free laser-only hallmarking registration. Read more about each marking method, and which is the right choice for your work on their website here. Take advantage of these offers by entering either code at the payment stage when registering at www.assayofficelondon.co.uk/registration. 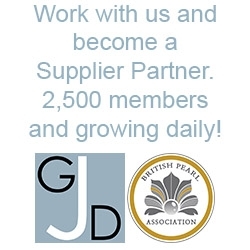 Please note that the subscribing Gold member discount code can be found in members' GoJD account area. Offers As a member of GoJD, register with the Goldsmiths’ Company Assay Office and benefit from: · Access to the Goldsmiths’ Library – 10,000 books, 15,000 images, archives, files, periodicals and journals all related to aspects of gold and silversmithing. Contact the.library@thegoldsmiths.co.uk to book your appointment. More information can be found at here. · A tour of the Assay Office. Details will be given about arranging it in your welcome pack, once registered. · 20% discount on any Goldsmiths’ Company Assay Office events. Please state your Gold membership of GoJD number when booking these events. · Downloadable badge within your online account for your website. · Access to all GCAO services.